Another in the wonderful series entitled Movie*Icons, that Taschen produces for the true, diehard fans of some of the world’s greatest actors and actresses. Everyone who draws a breath on this Earth certainly knows that devilish grin, the cocked eyebrow, and the deep, raspy laugh that makes up the incomparable Jack Nicholson. Everyone breathing also knows that he has some “thing” that no one can quite put their finger on. This slightly paunchy man usually has women less than half his age on his arm, a glass of liquor in his hand, and a cigar dangling from his lips – yet he is one of the most revered, and most adored actors in the world. What some may not know is that Jack didn’t get his big break until he was over thirty years old; over a decade after he actually began his acting career. Easy Rider was the film that launched him into the stratosphere, and his amazing acting ability has kept him there ever since. One of his finest performances, and the first Oscar that was placed in his hand, came from One Flew over the Cuckoo’s Nest (literally one of the best films ever made). That performance as he goes up against Nurse Ratched will forever remain on all reviewers top ten lists of all time. Who can forget when Jack slams that axe through the door in The Shining? The look on that face is pure evil; a man who has fallen off the edge into insanity. Not to mention when he screams, "You can’t handle the truth!” in A Few Good Men, and he was given an Oscar nod for less than fifteen minutes of work. That’s how unforgettable his moments are on screen. Jack could literally be on camera for five minutes and deliver a line so perfectly, that another golden statuette would have his name inscribed on it immediately. Terms of Endearment will go down in history as one of the biggest tear-jerkers of all time; Jack’s portrayal of the man who is falling in love with Shirley MacLaine is the perfect role for him. Whether it’s Heartburn, with the fantastic Meryl Streep, or Something’s Gotta Give, with Diane Keaton, he is the leading man with class, passion, and a gleam in his eye that shouts to the world that he will never grow up…nor do we want him to. Quill Says: Jack Nicholson is certainly an icon of the theatrical world who will spend the next fifty years – if he’s allowed – doing the one thing he loves the most…entertaining. 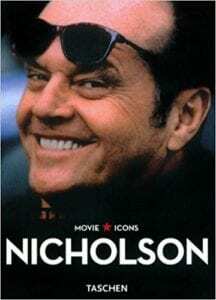 Where Nicholson is concerned, life will never reach that point where it becomes, As Good As It Gets; he will always work harder, strive for more, and have an amazingly fun time along the way. For any true “Jack” fan, this book is a must-have.